My friend Jaime came to visit a couple weeks ago, on the heels of our trip to Wales. We took a trip to Southwold, strolled through Cambridge, ate a lot of delicious food, and filled each other in on the last ten months of our life. Jaime’s been living in Israel and has been caught up in a whirlwind cross-cultural romance, which I was SO EXCITED to hear about. Because we painted this country red, I have a few posts to share with you. But I thought I’d start with the quintessentially Cantabriggian thing that we did: we walked through the Meadows to Grantchester. Walking to Grantchester is a Thing: you walk through the Meadows along the Cam to the Orchard Tea Room, where you can get cream tea (tea, clotted cream, jam, scones) and sit in green cloth deck chairs in a leafy setting. Because I am an idiot, I didn’t realise the first couple times I was there that the leafy setting where you take your cream tea is an ORCHARD – thus, Orchard Tea Rooms. I realised this as Jaime and I were sitting under a tree and I realised that there were tiny little fruits hanging off – yellow things the size of large cherries. Closer inspection: it was a plum. 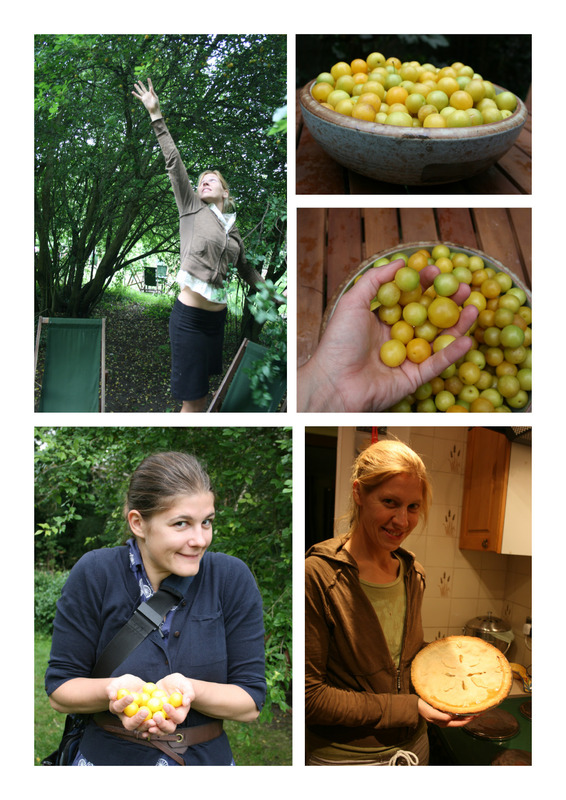 Jaime and I ate a few before running all over the place gathering plums. On our way our, we saw plums, pears, and apples – a whole cornucopia of fruit – but Jaime and I brought a crap-ton of plums back to the house, half of which we turned into a pie. A very, very tart pie, but a delicious pie nonetheless. St. David’s is technically a city, because it has a cathedral (a stunning cathedral, in fact). But it is a very small city, full of tourist schlock, ice cream vendors and cream tea peddlers (not to hate on ice cream or cream tea). We spent a happy afternoon there, although I think I got the most excited about the bougie deli with loads of local beer and cider and snacks. There was also a restaurant called Cwtch. That’s pronounced “cootch.” That was pretty funny, as was the polite notice on the espresso bar bicycle (see below). While in Cornwall, we rented a car and drove around the tiny fishing towns with crazy names, risking life and limb on teeny tiny little roads in tin-can stick-shift cars. The entire coast is linked by a hiking trail, so we would drive to a town, park, stroll around and then do a little walking along the coast. If I saw a new bird, I’d freak out (15! 15 new birds in one weekend! ); otherwise, we’d have a calm, brisk walk around the town and environs before moving onto the next. All the towns were all notable for their small population, their quaint huts, and their flotilla of itty-bitty fishing boats tied to the winches in the harbours. 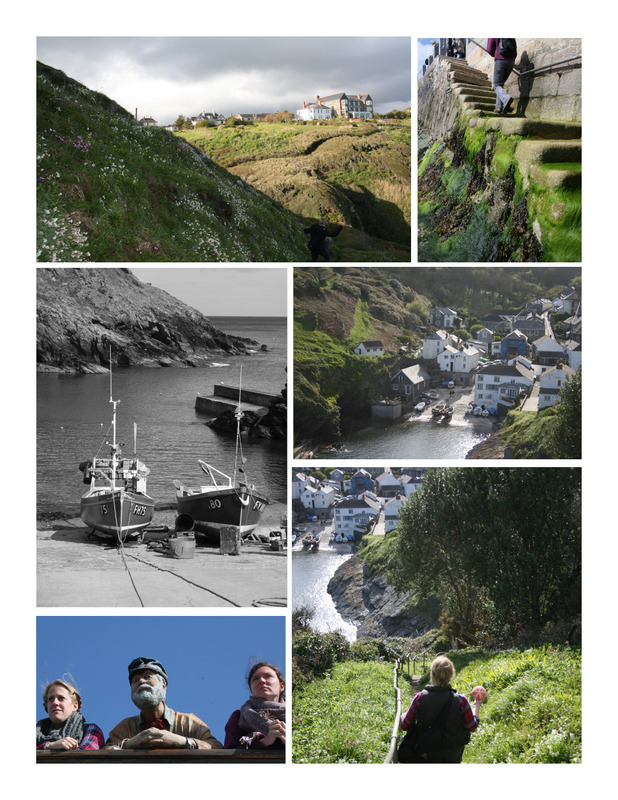 My personal favorite was Portloe, which was the tiniest (the middle row and bottom-right photos above are Portloe). 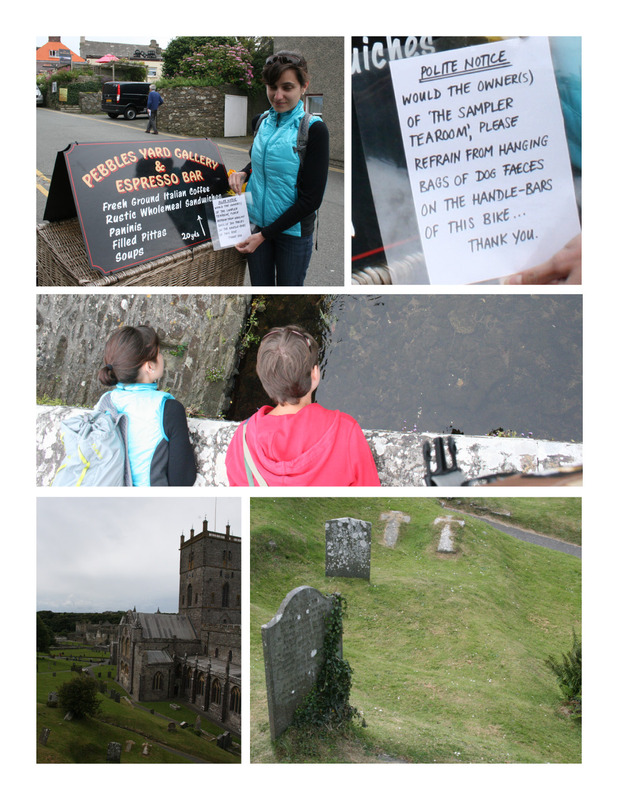 We got lunch in St. Mawes, cream tea in Portloe, and dinner in Mevagissey – so that might have something to do with it. But Portloe was (despite a centrally-located parking lot), also the most meticulously maintained, relentlessly perfect town of the bunch. I know that fishing is dangerous and there’s actually a lot of deprivation in Cornwall, in part due to depleted fishing stocks. But damn, its hard to think that life is anything but perfect in these places.